Advanced Oxidation Process (AOP). We've all heard of it, but what is it exactly? How can it be applied to purify water in spas, domestic swimming pools and commercial swimming pools? And, more importantly: why do many call it 'the next big thing' for pool purification? This blog aims to explain the workings and benefits of UV and ozone for the health and pleasure of swimmers. What is Advanced Oxidation Process (AOP? Advanced Oxidation Process refers to chemical treatment that sanitizes and disinfects water by oxidizing organic and inorganic contaminants with ozone. AOP systems are not new. They have been used for many years to treat wastewater. Applying the process for pools, however, is relatively new and upcoming. Water treated by the means of AOP provides many benefits, mainly because the amount of chlorine (and therefore chloramines, responsible for eye and skin irritation and the typical “chlorine” smell) in a pool can be reduced drastically. The main difference between ozone and UV is that ozone oxidizes and UV disinfects. The amount of ozone produced determines if a device is suited for domestic pools and spas (point 1) or for commercial swimming pools (point 2). Water flows through the system, which is a lamp in quartz glass with a double function: it produces UV-C light and produced ozone at the same time. First, the ozone generator turns oxygen - which is being sucked in from the surroundings into the system - into ozone. 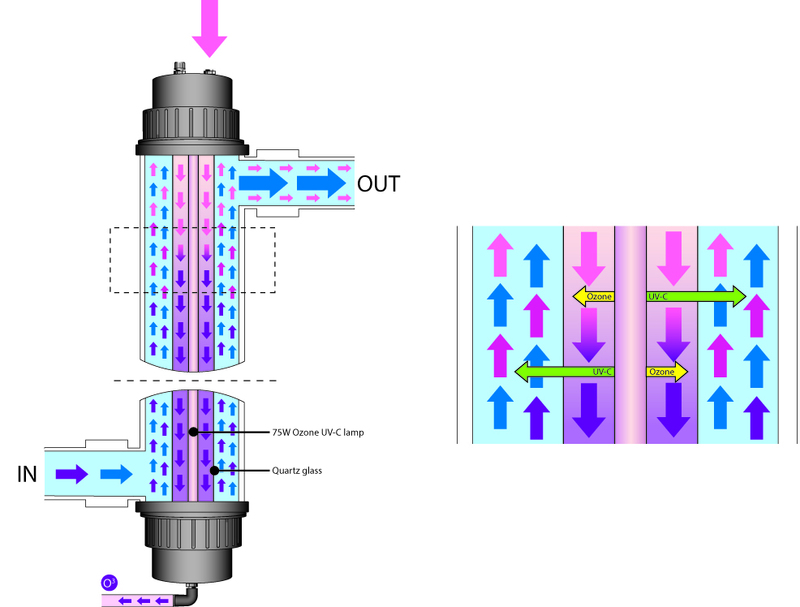 With the venturi injection method, the ozone is then dissolved into the pool water. The ozone (about 0.6 grams) in the water treats harmful micro-organisms very effectively by the means of oxidation. 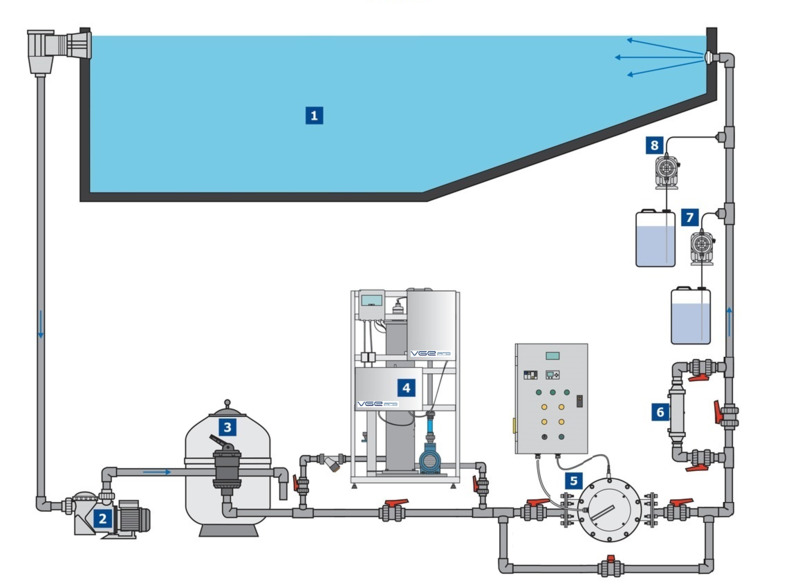 Right after it has completed its function, the treated water flows through the UV-C unit, where the UV-C light disinfects the pool water and turns ozone (O3) back into oxygen (O2). These workings making sure the water that returns to the pool contains absolutely no waste that might be harmful to swimmers. It will reduce chlorine concentration up to 50-80%! This method, combining the strength of Ozone and UV-C are very beneficial for domestic pools and built in spas. More about the special developped compact AOP purifier can be read here. The theory behind ozone in combination with UV-C to purify commercial swimming pool water, is the same as explained before. However, of course, on a larger scale. Therefore there are bigger, heavier and more complex AOP systems available; systems which are highly suitable for commercial pools. Commercial pools are generally bigger and are being used more intensively. When a larger amount of ozone is being produced and combined with UV, also more hydroxyl (OH) free radicals are being produced. The strong oxidation created by OH free radicals reduces organic and inorganic contaminants in the pool water faster and more efficiently than ozone and UV – and certainly chlorine - alone can achieve. The dramatic improvement of disinfection efficiency combined with a tremendous reduction of chlorine concentration definitely make AOP a highly popular and promising solution to treat pool water. If you want to know what AOP can do for your swimming pool or built in spa projects, simply contact me by hitting the button below. I am more than happy to provide you with a suitable solution for your business.